The Edge is known for its many innovations, including an optional SYNC with MyFord Touch telematics interface that keeps drivers connected to their worlds, even while on the road. MyFord Touch can be controlled using voice-command technology or by touch with simple touchscreen controls. If you purchase the new 2013 Ford Edge at our Phoenix area dealership and choose the MyFordTouch option, you'll get to take advantage of all the system improvements that took place last year. If you currently drive a previous model of the Ford Edge and are interested in learning about MyFord Touch upgrades available for existing owners, please contact Peoria Ford today. The new and improved system features a wide array of enhancements and additions, from larger more easily readable fonts to the addition of Audible.com audiobooks access. Additionally, maps functions have been updated and the system now features a faster touchscreen response time (two times faster to be exact), on top of improved and more streamlined Nuance-driven voice recognition technology. These are only a few of the changes you'll be able to take advantage of when you purchase a 2013 Ford Edge in the Phoenix metro area! Learn more about the Edge and all of its technologies in the full review below! When considering the 2013 Ford Edge side-by-side with the 2013 Nissan Murano, Kia Sorento and the Jeep Grand Cherokee, and you can catch that the Edge wins over those autos in oodles parts. Pay attention to the hightlights below. Like the Edge? Get a quote on your trade-in and save! Peoria Ford's car repair squad have served Phoenix for years with amazing workmanship and trustworthy Ford parts. If you shrug off getting dependable repair work, your Ford Edge's condition might shatter, so drive it to the skilled mechanics at Peoria Ford. The following is only a small percentage of what we handle: in-cabin air filter fixes, transmission repairs, battery replacement and much more. We also manage a variety of related services. From the incomplex to the complex, Peoria Ford deals with it all and offers reasonable prices, customized service and masters mechanics. Get specials on our website. You can look through discounts by clicking the following line of text. Want to stay in the know about discounts and specials at Peoria Ford? Then connect with us on Facebook and Twitter to learn about deals as they pop up! Don't miss sizzling summer specials, fall savings, wintertime discounts, end-of-year clearances and much more. You may also be able to save a significant amount when you purchase your Edge with the help of customer cash, dealer cash, low APR financing and other limited-time dealership and manufacturer incentives that come around throughout the year. Additionally, you can sign up to receive Peoria Ford's monthly newsletter, which features information about sales events, dealership news, and auto service and repair coupons, as well as articles about Ford's latest cars, trucks and SUVs. 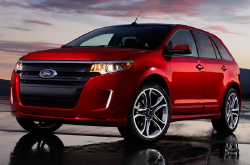 Test drive the 2013 Ford Edge in the Phoenix metro area. Peoria Ford is conveniently located at 9130 W Bell Road and is proud to serve residents in several local cities including Avondale, Litchfield Park, Glendale, Scottsdale, Tempe, Mesa and more. Please call us or fill out an online contact form to schedule an appointment with one of Peoria Ford's sales professionals. We look forward to hearing from you soon! Search our inventory of the Ford Edge today!